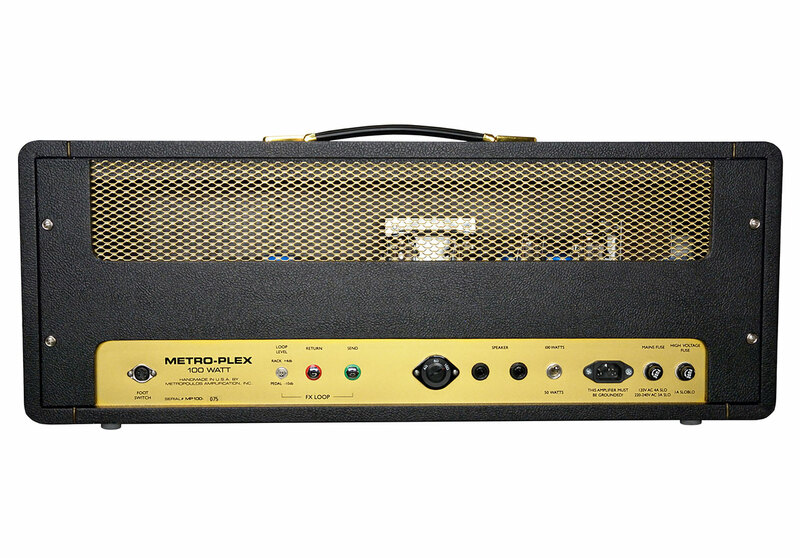 The Metropoulos Metro-Plex - the answer for everyone who dreams of authentic Plexi tones with modern features and convenience. Years of reverse engineering and R&D has all coalesced into George Metropoulos' modern day masterpiece, the Metro-Plex. Using his own '66 45/100, '67 Superlead, '69 Superbass and '70 Superlead as the templates, each important era of the famed 100 watt amp is now available in one amp. These are amps you can't create from schematics and data sheets. You can't even buy a replica this true in music stores. No production amp incorporates this level of detail or, in a word: obsession. You'll hear it immediately, you'll feel it deeply and your playing will respond sub-consciously. 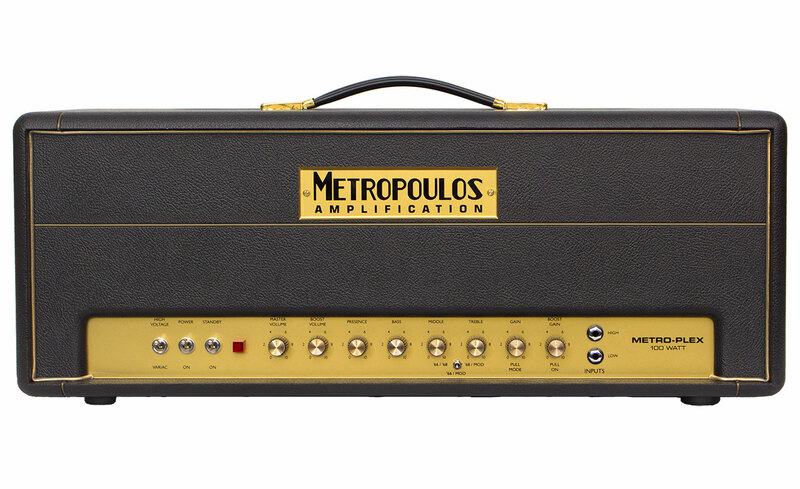 The final word in a Plexi replica: The Metropoulos Metro-Plex. The Metro-Plex is a 100/50 watt head featuring a PLEXI mode w/ master, a MODDED PLEXI mode w/ master, a JTM 45/100 mode, a BOOST mode, a built in variac and built in FX loop. The master volumes truly allow bedroom volume without degrading the tone, like no other before. With this amp you have squeaky clean to full-on scream at your fingertips (and toe tips via the foot pedal). - Each mode, PLEXI and MOD, has two possible voicings. - PLEXI mode is selectable between the JTM 45/100 voicing and '68 Superlead voicing. 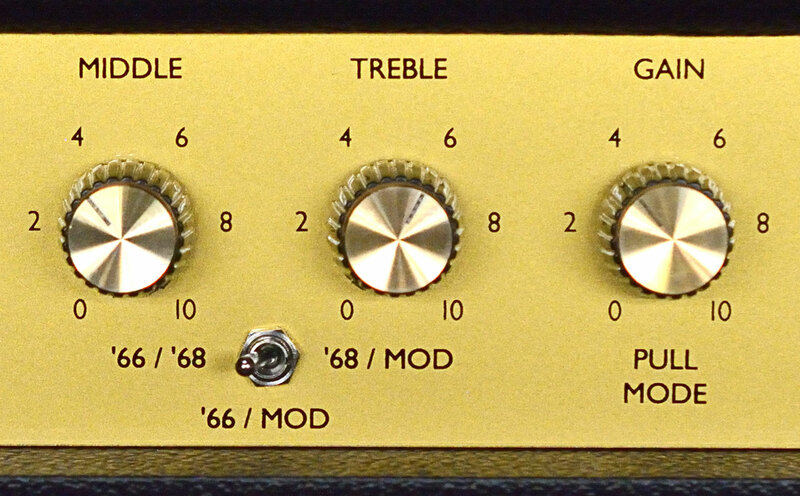 - MOD mode is selectable between the '68 Superlead voicing and Modded Superlead voicing. - BOOST is a separate function, which can be applied to any mode. Think of it as a high voltage, clean boost in front of the amp. Just built in. Click here for a useful overview of the suggested settings for the Metro-Plex. "I've been searching for an authentic sounding, usable Super Lead Plexi for 25 years, ever since it no longer became practical to use my original. I've tried and owned many mnay amps and have been to NAMM a dozen times to try almost every amp available on the market. Many have claimed to have harnessed the Plexi sound and feel at a reasonable volume, very few have come close, until the Metro-Plex. "The Metro-Plex is exactly what George claims. It nails the best of the classic Plexis to a level of perfection I have never experienced previously in any amp, EVER !!! The icing on the cake, it does this running a full 100 watts with a master volume that is so effective it will blow your mind. If that's not enough then add three modes, a Variac switch, 50 or 100 watt selector, solo boost with its own gain and volume, an incredible effects loop and you have every conceivable Plexi tone from 1966 to 1986 and beyond. I had to have it and have been over the moon since aquiring it. "The Metro-Plex is the definitive history lesson in the ever-coveted “British” tone evolution. The amp takes you effortlessly from 1966 thru 1968 and beyond. From vintage to modern. From the most lush crystal cleans to the richest vintage high-gain sounds you could possibly imagine. Jimi, Eric, Jimmy, EJ, Pete, Paul, Eddie...they’re all in there in the most authentic way your ears will ever hear, leaving you wanting for nothing. In short, the Metro Plex actually is the 'desert island amp' none of us thought would ever exist-but now it does. With the Metro-Plex, just plug your guitar straight into the amp, the way you always wished you could, and enjoy the tones you’ve always fantasized about. "George, thank you again for all the help in making me an extremely proud owner of the Metropoulos Metro Plex. I can’t say enough about how gracious you were/are with your time and efforts in helping me not only come out to your shop to try a Metro-Plex in person, but then hand delivering it to me in order to save me the trip back out again. Not to mention my countless questions over messages/emails throughout the entire process. This kind of excellent small business oriented customer service was a small, but very important factor in my decision to take the plunge with Metropoulos. It’s a great feeling buying something from someone who clearly cares about not only making an exceptional product, but satisfying every customer expectation as well. "The Metro-Plex is, in a word, amazing. The pure Plexi tones it delivers are spot on with the Plexi tones I hear in my head. Having had the opportunity to play it side-by-side with your actual vintage Marshall ’66 45/100 and ’68 Plexi, I can honestly attest to the fact that you nailed it in terms of both tone and feel. I must say that after having played the vintage pieces, I actually prefer the Metro-Plex. I’ve owned and played countless amps that claim to do the 'Plexi' thing and the 'modded' thing in one amp (Wizard, Friedman, Colby, Suhr, Egnater, Fargen, and Top Hat to name a few), and this is the first time I feel like an amp actually delivers on those claims. What you’ve accomplished here is something special to say the least. "The features this amp brings to the table are perfect for my gigging needs. The boost function sounds better than any stomp box I’ve owned, giving as much added gain as I could want, but without completely coloring the base tone. It really sounds every bit as good as a perfectly balanced added tube stage. The loop works fantastic, even with my long cable runs, and the 3 modes offer up a plethora of tones to cover all of my rock bases. The way the amp cleans up with the guitar’s volume knob makes getting clean tones pretty effortless in any scenario. Add the ½ power switch and Variac functions, and I really have an endless palette of tones to spend my days obsessing over. "They say you don't really form an opinion of an amplifier, heck, any instrument until the 'honeymoon period is over.' What if the honeymoon never ends? What if every time you click on the mains and standby you still get the same dumb smile plastered on your face that you did the first time? Where you're not fighting the controls to dial in your sound, but exploring the ranges of the controls still finding new tones? You plug in a different guitar and new possibilities open up. The overall sound is familiar but the nuances waiting to be explored are new. Dynamics have a meaning that goes beyond switching from the clean channel to the crunch channel. All the nuances of your playing rest firmly within the guitar's volume control, tone controls, your picking attack and your fretting technique - in your hands, quite literally. The way it should be.